If you are in the mood for a massive burst of nostalgia, double denim, shell suits, leg warmers and Lycra, Flashdance is the show for you. That’s not to mention the best dancing I have ever seen at a show in Aberdeen to all your favourite 80s classics. What’s not to love? 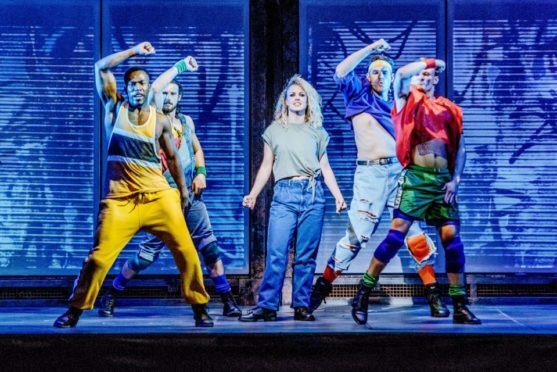 Strictly Come Dancing champion Joanne Clifton shone on stage as lead character Alex Owens, portraying the young and feisty welder with dreams of one day becoming a professional dancer. Having been an avid watcher of the BBC1 TV show I knew Clifton could dance but I was absolutely blown away by her voice. Delivering a pitch-perfect rendition of all her numbers, some of them challenging, I could have listened to her singing all day. And the way she moved across the stage was hypnotic. At times I was wishing the songs would last a little bit longer so I could continue to watch her dance. Special mention also has to go to Hollie-Ann Lowe for her portrayal of Gloria, Sia Dauda who played Kiki and Verity Jones, who stepped in to play Hannah in Carol Ball’s absence. All three supporting actresses were outstanding. For those 90s pop fans out there, the leading man Nick Hurley was played by the former A1 frontman Ben Adams. I feel had he not been starring alongside Clifton he would have made more of an impact, but for me she stole the show. For those of you who haven’t seen the film, I won’t give out any spoilers but for those who have seen it, be safe in the knowledge that the original scriptwriter Tom Hadley was instrumental in the stage show adaptation. All in all, a wonderful performance by all to fabulous music, orchestrated by a brilliant band and completely deserving of the standing ovation it received at the end. My advice to you is don’t be a maniac and get yourself down to HM Theatre for a taste of what’s on the dancefloor.